Unfortunately there are not any hotels at Linate airport itself. However it is very close (about 7km) to Milan’s historical city centre which is host to many popular tourist attractions for all ages. Fashion is one of the biggest attractions of Milan as it is known as the fashion capital of Europe, but it is also a popular place to visit with its history of art and the architectural beauty of some of the buildings and churches. During your stay in Linate you may decide to visit the open-air stage which is located close to Linate Airport. It is actually a ‘floating’ stage on the Idroscalo Lake which plays host to many concerts throughout the year. The man-made lake was originally owned by the airport for use of the sea planes a few years ago. 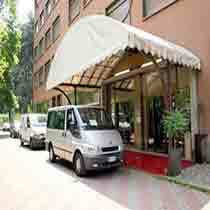 Listed below is a very small selection of hotels near to Milan Linate Airport. The Hotel Milano is located near Orto Botanico di Cascina Rosa in Novegro property which is 1400 metres from the motorway and within 7km of Milan Cathedral and Orto Botanico di Cascina Rosa. 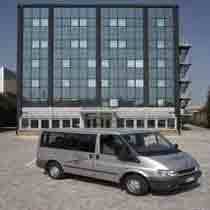 It is just 500 metres from Linate Airport and provides a complimentary shuttle service. The 102 soundproofed guest rooms are well equipped with air conditioning, LCD television, pay per view movies, direct dial telephone, free internet access, mini bar, hairdryer and in room safes.Other amenities at the Air Hotel Milano Linate include the Pegasus American Bar & Restaurant, buffet breakfast, a complimentary airport shuttle, and meeting rooms which can accommodate up to 100 people. The Acqualife Centre at the hotel offers a heated swimming pool. Turkish bath and fully equipped gymnasium. The Novotel Milano is close to the Orto Botanico di Cascina Rosa, 6km from the centre of Milan and just 4km from Milan Linate Airport (free shuttle service provided). 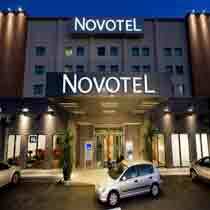 The Novotel Milano Airport is a modern hotel with 206 guest rooms which come equipped with satellite television, a minibar and hairdryer. The Novotel Café is open 24 hours a day and there is also a bar, outdoor pool, garden and garage parking.The hotel is ideal for business trips with a Convention Centre offering 8 meeting rooms which can accommodate up to 320 people as well as a business corner and WiFi access. The Crowne Plaza Milan Linate is located 7km from Milan City Centre and about an 8 minute drive from Milan Linate International Airport (free shuttle service). 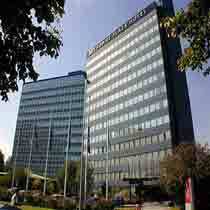 The Crowne Plaza Hotel Milan Linate offers good amenities including a restaurant, bar/lounge, and fitness centre. The guest accommodation all comes well equipped with ensuite bathrooms with bathrobes, bidets and a hairdryer and the rooms have sofa beds, satellite television and minibars. The Hotel Montini is a modern hotel in Peschiera Borromeo situated just a few minutes from Linate Airport and close to Milan’s Tangenziale Est Ring Road and terminus of the San Donato Milanese underground. Its prime location makes it easy to get to downtown Milan and the city’s suburbs. Hotel guests can use the shuttle bus which operates from 07.00 to 23.00 for Linate Airport, the MM3 underground station, the San Raffaele and Cardiologico Monzino hospitals and San Donato Milanese with the centre of Milan is just five minutes away by public transport (ATM line 66). The Hotel Montini has 65 air conditioned guest rooms with satellite TV, direct dial telephone, Wifi (also in the public areas) and a mini bar. The hotel also offers one and two bedroom apartments.Guests can use a Sporting Centre which is just one kilometre from the hotel and offers a gym, personal trainer, indoor and outdoor swimming pools, tennis courts, a practice golf course and wellness spa centre.